Move over on the Broom! 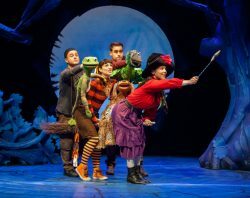 JULIA Donaldson and Axel Scheffler’s Room on a Broom, ideal for children aged three and older and their families, comes to Southampton’s Nuffield Campus theatre from 19th to 24th February. This Tall Stories show is a magical, musical stage adaptation of the popular picture book, promising a quintessential family treat with songs, laughs and scary fun! Posted in Half Term Fun, Ragazzata, The Play's the Thing on 11 February, 2019 .